Posted By Katia Millet on Mar 18, 2019 in GO DUTCH ! The group gifts, always a hot item. In the past on every 1st day of the month I visited my groups stores to pick up their monthly group gift. These days they are much harder to find. But! Today on my blog and on several following blogs I will show you some stores that have awesome group gifts and a free join or a low enrolment fee according to the many gifts you can find there! Today the first 2 stores. * Maaike Omega skin applier in pineapple tone, available at the Skin Fair 2019 by 7 Deadly s[K]ins till March 24th. * Esmeralda dress is a gift from the Lucky boards at Hot Fuss. They are group boards but the group is free to join. There are 12 Lucky boards, the left ones are group only, 6 boards on the bottom are group only. The rest is free to click. There are also 15 group gifts available. This dress comes in 5 mesh sizes and a colour change HUD with 5 options is included. * Throwback glasses are one of the group gifts at Hot Fuss. And you can also find them on one of the lucky boards. * Marre hair is from the lucky chairs at Mina. No group needed for these chairs. * Esmee dress by Hot Fuss is one of their free lucky boards gifts. 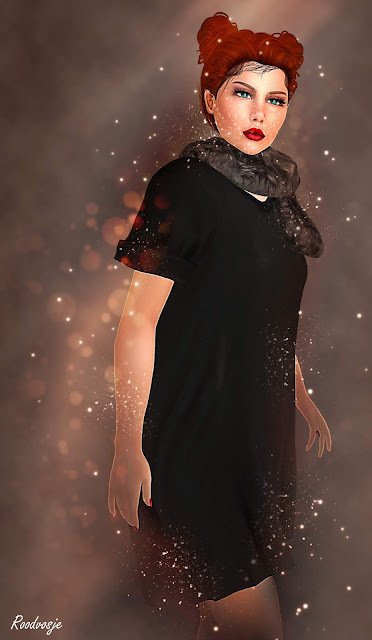 This dress fits Maitreya, Belleza and Slink and a colour change HUD with 20 colours is included. * Classic Pearls set is by Lazuri and you can find it for 1 L$ on Marketplace. This set is colour change by touch so you can adjust it to all your outfits. * Fiona hair is from the lucky chairs at Mina. No group needed for these chairs. * Poses are by Posesion Poses. * Cherrylicious dress i Hot Fuss is one of their group lucky boards gifts. The group is free to join. This dress comes in 5 mesh sizes and the top has 2 texture options. * Heart shaped bag is a gift from the free Gift board at T&C Creations. No group needed for this board. The gifts change so you might find something else there. * Gracianne heels by Heels. * TeeDress is one of the many group gifts you can find at Coco Design’s. The group is free to join, not all gifts are mesh. This dress comes in 3 mesh sizes. * The Fur scarf is another group gift you can find at Coco Design’s. It comes in black, grey and light brown. Some styling tips for this dress. * Hulya scarf by Bens Beauty is one of their group gifts. This group is free to join and you find a package with 4 gifts under the group joiner. The scarf is colour change. * The Vivien clutches by Sheba are colour change and they are 1 L$ on Marketplace. * Christmas scarf with colour change HUD is by Mel’s Flow and it is yours for 1 L$ from Marketplace. * Satchel Bag is by The Bubblegum Tree and it is 1 L$ on Marketplace. * Avenu Spring collection makes this dress light up. It is by Lazuri.